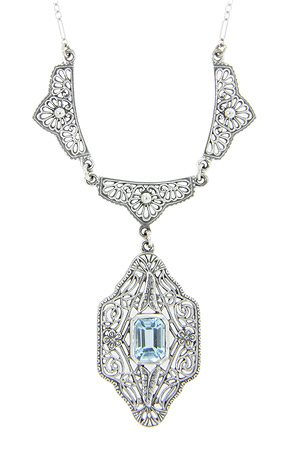 Intricate floral filigree decorates this sterling silver antique style necklace. At the center of the pendant is a faceted rectangular blue topaz. The pendant measures 1 3/8” in length by 3/4” in width. The three links about the pendant each measure 1” by 3/8”. The necklace as a whole measures 18 1/2” in length.